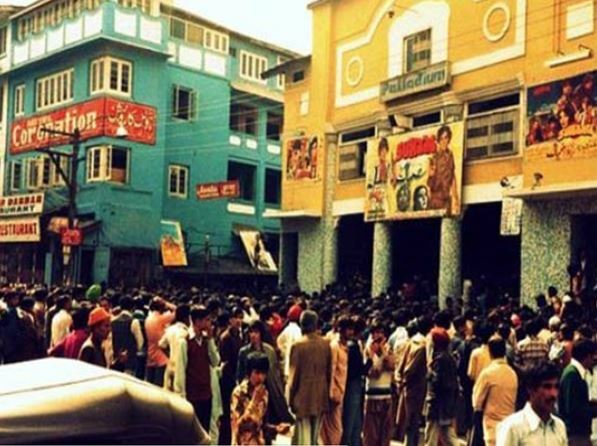 The above picture ascertains that Kashmir was undoubtedly a cinemagoers paradise before militancy-hit the valley in 1989. Sadly Palladium, Neelam, Broadway, Regal, Amrish, Khayam, Nishat have faded into the memory of the residents of the valley. And the 90’s generation is only glued to small screens of TV, phones, and desktops unaware of the movie magic. The logic behind watching movies on the small screen is Halal but going to theaters is Haram is hard to digest or does it smell only of double talk? Indian filmmaker’s fascination with Kashmir’s breathtaking natural beauty is well known and their love for Kashmir is undying. That’s why despite security threats they keep getting back to the valley for films like Rockstar, Bajrangi Bhaijan, Haider, Yahaan, Raazi etc. Why cinema is despised so much in the valley now? This is because the word “normalcy” is feared the most by the separatists. Reopening cinemas & theatres would mean Kashmiris have healed, which would defy the vendetta from across the border. Because the tactics to keep Kashmir boiling will be countered; therefore the way all other rights are curbed, a Kashmiri is deprived of the right to recreation and entertainment too by these “handlers”. Separatists might claim religious reasons and politicians will accuse each other and the nexus of cable mafia may keep cinema closed but the fact remains that people in Kashmir love theatre and movies. Why do these radical groups enforce their will on the people? Can’t Kashmiris like all others decide if movies are good or bad for them? The fact that former J&K Chief Minister’s son Tasasduq Mufti (well known for his cinematography in movies like ‘Omkara’ and ‘Kaminey’) chose film as his career after obtaining a degree in cinematography from an American school, means that his father did approve of the same. Then why other Kashmiris are shamed for pursuing a career in films or merely watching films? The good news is that Heaven movie hall in Anantnag has been revived by CRPF and reopened for the locals with a seating capacity of 525. The last movie screened here was Amitabh Bachchan-starrer Kalia in1991. This is a welcome change for the youth of South Kashmir. This brings a breeze of change in the valley. The success of Kashmir World Film Festival ascertains that such measures will help restore normalcy. The very fact that the festival was organized for the second time in the same year (KWFF was conducted at Tagore Hall Srinagar, from 1-5th Nov 17, & 18) is proof that the festival is getting, the right support from the local people, most importantly the youth. Year after year it is seen that tourism has suffered a setback and shut down of cinema which is symbolic to disturbance contributes further. Reports of growing psychological disorders in Kashmir are on the rise. Reopening cinemas could be a perfect way for the Kashmiri’s to relax, diffuse anxiety and enjoy family time. Since many films transmit ideas through emotion they can neutralize the instinct to suppress feelings and trigger emotional release. What Kashmiri’s need is to elicit their emotions, watching movies can definitely open doors that otherwise have been closed for long.